Balthazar with the sword capable of killing Atropos. Before the Apocalypse, Heaven may have been corrupt, but it was stable. The staff was safely contained. It's been chaos up there since the war ended. In that confusion, a number of powerful weapons were stolen. Angelic weapons are implements belonging to Heaven that are imbued with some supernatural power, the most common is the angel blade. Following the imprisonment of Michael and Lucifer in Lucifer's Cage, the first civil war takes place in Heaven between Castiel and Raphael. A collection of powerful weapons from Heaven's armory disappears, and they are then sought by rival factions of angels. In the battle between angels to control Heaven, Castiel says "Whoever has the weapons wins the war." Raphael wants the weapons so he can take control of Heaven and restart the Apocalypse. It is discovered that Balthazar stole the weapons, and wants them for his own unstated ends. He uses a portion of one weapon (the Staff of Moses) to buy Aaron Birch's soul, and destroys Raphael's first vessel with another (Lot's Salt). Eventually, after Raphael targets everyone who knows Castiel, Balthazar, among the targets, decides to turn the weapons over to Castiel and send Virgil, Heaven's weapons keeper, on a wild goose chase to an alternate universe as a diversion. Castiel confirms to Raphael at their next confrontation that he has the weapons, which forces Raphael to flee. Later, Lucifer seeks out especially strong heavenly weapons that may be on Earth in order to stop the Darkness, even having his demons search his crypts. This short, silver blade can wound and kill angels. Multiple blades exist, and by season five most angels are seen to carry them. It has been shown that humans and demons are capable of effectively wielding them as well and they are deadly to angels, demons, hellhounds, reapers and Nephilim. Additionally, it can kill werewolves and potentially other monsters. A longer sword version of the angel blade carried by Grigori, or Watcher angels. Claire Novak killed a Grigori, Tamiel, who had been hiding on Earth, and now is the only other known carrier of this weapon. Unlike standard angel blades, angel swords are capable of inflicting wounds that even angels cannot heal. Castiel tells Sam and Dean there is a weapon that will kill Fate. 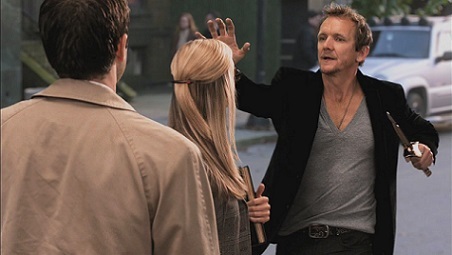 Balthazar appears behind Atropos with a blade but Castiel stays his hand. The weapon appears similar to an angel blade although the blade is more rapier-like in shape, and it is golden in color. The archangel blade appears to be the only known weapon that can kill an archangel, but only when wielded by another archangel. Like a standard angel blade, the archangel blade is a dagger-like weapon, differentiated by its golden color and twisting tri-blade design. Gabriel intended to use one on Lucifer when he confronted him in the Elysian Fields Hotel, however this blade appeared to be a standard angel blade and was eventually determined to be a fake. An archangel blade is later recovered by Asmodeus, who planned on having an imprisoned Gabriel use it against Lucifer. Ketch was able to steal the blade along with Gabriel and his grace and deliver everything to Sam and Dean in exchange for protection from Asmodeus, who he feared would hunt him down and kill him for his actions. While acting as the vessel to the Apocalypse World Michael, Dean was able to use the archangel blade to kill Lucifer though the blade's power spared Lucifer's vessel Nick from being killed in the process. Sam pretends to have found the Ark of the Covenant as a ruse to get Castiel to help him and Dean. Later on in the series, Dean witnesses a piece of the actual Ark of the Covenant being found and used. The Ark is considered a Hand of God. This is a subclass of heavenly weapons. According to Lucifer, these antediluvian weapons are artifacts on Earth which were directly touched by God and imbued with God's power, though most were believed to have been destroyed during the Biblical flood due to their instability. Mortals cannot survive touching these objects, and the power of the object can only be used once before it's depleted. Hands of God have been used by Delphine Seydoux with a piece of the Ark of the Covenant, Crowley with the Rod of Aaron and Lucifer with the Horn of Joshua. When people start being compelled to tell the truth, Dean and Castiel suspect that it may be caused by Gabriel's Horn of Truth. However the Horn is not found in the city, and the culprit is revealed to be the goddess Veritas. According to Gabriel, who was an illusion made by Metatron, the Horn is in actuality a powerful spell -- a special sigil that when drawn, acts as a beacon to all angels. The Horn was recovered by Metatron, who had Gadreel use it to attract angels to abandoned warehouses to recruit them or kill them. The Horn was the shofar used by Joshua in the Battle of Jericho along with the Ark of the Covenant to cause the surrounding walls to crumble so that his forces could invade the city. It was located in the Ad-Nafud Desert in Saudi Arabia by Noel, an archaeologist who had sold his soul to Crowley almost ten years prior in exchange for understanding every secret about the world, including the supernatural. Crowley agreed to return his soul in exchange for the Horn to use its power against the Darkness. After Sam and Dean were able to trap Lucifer using the Horn as bait, the warding Rowena placed on the trap failed, allowing Lucifer to take the Horn. Amara later appeared by tracking Rowena, and Lucifer drained the energy in the Horn to use it against her, but Amara was left unaffected by the blast. A lance which once belonged to Michael, made for the purpose of defeating Lucifer and making him suffer. It has the power to quickly turn any demons into dust, while conversely causing angels to essentially rot away, dying slow and agonizing deaths. After being used to kill the Prince of Hell Ramiel, the Lance was destroyed by Crowley to save the life of Castiel. When the angel smiting that had destroyed Sodom and Gomorrah turned Lot's wife into salt, this crystal was unknowingly created as a result. Lot's Salt turns a human body into a pillar of rock salt, making it uninhabitable for angels. It was used by Balthazar to destroy Raphael's vessel, Donnie Finnerman, and save Castiel's life. A spear stored by Lucifer in one of his crypts and retrieved by demons after he reclaims Hell. Lucifer later wields his spear in battle against the Darkness, impaling her through the back with it after she is struck by the combined powers of witches, angels, and demons. Lucifer's spear is able to defeat Amara in her weakened state. Given to Moses's brother Aaron by God on the Sixth Day, the rod is considered a Hand of God and is capable of incredible destructive power. It was sought out by Lucifer during his search for weapons to defeat the Darkness, but was used by Crowley in a failed gambit to kill Lucifer. Crowley described holding it as, "So this is what it feels like to be God," and seemed to suffer no negative side effects from its use. After aiming its power at Lucifer, Simmons, one of his demon minions, jumped in the way of the blast, sacrificing her life to save Lucifer's. After attacking Lucifer its power was dissipated and the Rod was left behind when Crowley teleported away. This staff can generate any of the ten Egyptian plagues. Its powers can affect angels and humans. At first, it seemed that the "Sword of Michael" was an actual angelic weapon which Michael used to defeat Lucifer, but it is later revealed by Zachariah that Dean Winchester is in fact "Michael's Sword" - Michael's true vessel. The angels later decided to revive Adam Milligan to use him as a vessel for Michael, telling him that he is Michael's Sword as well, but this turns out to be a ruse to lure Dean into the Green Room with Zachariah. In an attempt to save Sam and Jack Kline from Lucifer, Dean reveals to Michael that he is his sword and perfect vessel, a fact Michael apparently already knew. Dean offers his consent to allow Michael to possess him in order to kill Lucifer, but stipulates that Dean has to be in control the entire time and Michael has to leave when it's over. Michael accepts his terms. They teleport to the church and wage battle against Lucifer and the ensuing fight ends with Dean killing Lucifer with Michael's archangel blade. Their victory is cut short when Michael reneges on his deal with Dean by taking complete control of his body and leaving Sam and Jack. Michael later leaves Dean's body on his own, but repossesses him as Michael prepares to make his move. Dean later manages to reclaim control of his body and lock Michael within his mind. This page was last edited on 27 March 2019, at 07:45.